An intoxicating mix of Arab and Berber cultures overlaid with the rich heritage of the Muslim faith, Morocco is a spellbinding land which draws upon its many influences yet has a distinct and exotic culture all of its own. The diversity of the landscapes in Morocco is one of the major attractions of the country and makes any trip a scenic pleasure. 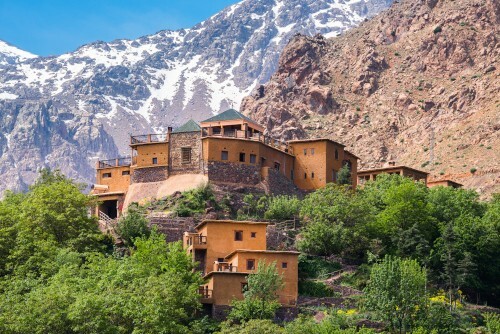 Desert wilderness gives way to green valleys full of orange groves, Imperial cities pepper the plains, breezy beaches fringe the coast and ancient Berber villages huddle in the Atlas mountains. Hospitable people, mouthwatering food and a glorious climate are the icing on the cake. There are many wonderful experiences to be had in this North African jewel. For further inspiration take a look at the trip ideas put together by our trusted local experts at the foot of this page, but in the meantime here are our top three things to do in Morocco. Step back in time exploring the medinas of Morocco’s ancient cities. The narrow lanes buzz with commerce, donkeys lumber through laden with goods, craftsmen tinker in workshops and the call to prayer hangs in the air. Fez boasts the the best preserved medina in the Arab world, with dark doorways hiding sunny courtyards or ‘riads’ decorated with intricate tilework, fountains and greenery. 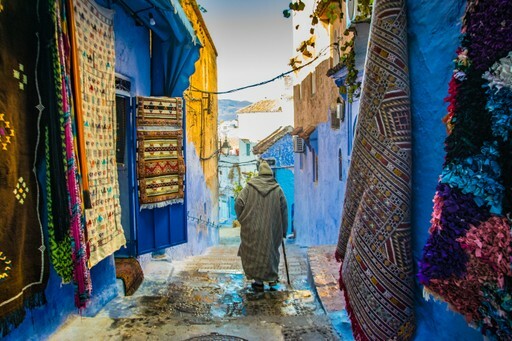 Marrakech has the biggest souk and impressive palaces, while Chefchaouen’s medina is a masterclass in every shade of blue. 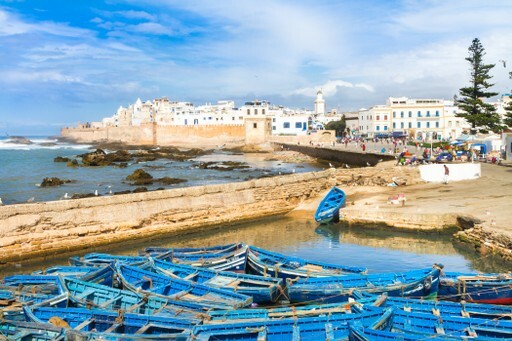 Essaouira is an elegant coastal base with a pretty old town and a strong maritime tradition. Potter through the souk, browse the boutiques and admire the azure boats in the harbour before hitting the beach for some relaxation. Known as the ‘Windy City’, it is famous for its breeze, which keeps the temperature pleasant year round. Much of the town retains its original fishing-port charm, and you can enjoy fresh fish chargrilled to perfection on an outdoor brazier. The Atlas Mountains are wild and beautiful, scattered with earth coloured villages, photogenic valleys and challenging peaks. An oasis of cool air and green pastures, the mountains rise just south of Marrakech and are accessible from much of southern Morocco. Relax in a garden ksar, visit traditional Berber villages, and experience legendary local hospitality. Whether you just feel like a break from the heat of the city or a multi-day trek to distant snowfields, there is a world of clear streams and peaceful valleys waiting for you. Morocco’s vast deserts are best avoided during midsummer as the scorching heat makes staying out in the daytime unfeasible. With the benefit of a sea breeze, however, coastal towns can be hot in July and August without being unbearable. Spring is a fantastic time to visit Morocco, with warm weather on the coasts, desert, and mountains – which at this time are lush and green. 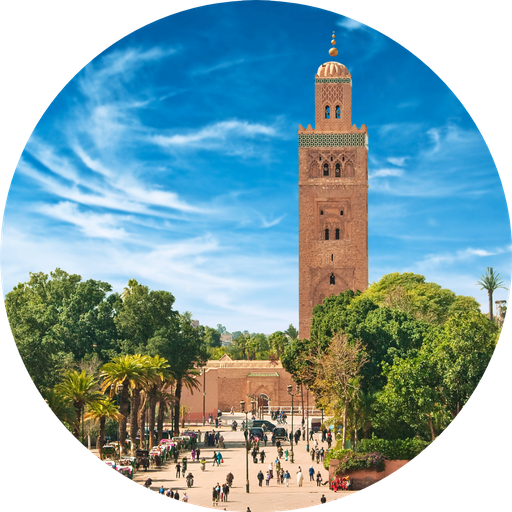 Morocco can still be enjoyed during Ramadan, but food will only be available from tourist-oriented establishments during the day, and out of respect you should not eat or drink in public during this time. Create your bespoke holiday to Morocco!